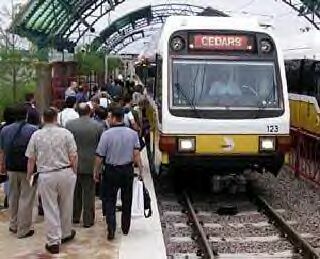 Dallas's widely acclaimed light rail transit (LRT) system crossed another milestone on 1 July 2002, opening an additional 9.3 miles of new route and several new stations serving suburban communities for the first time. 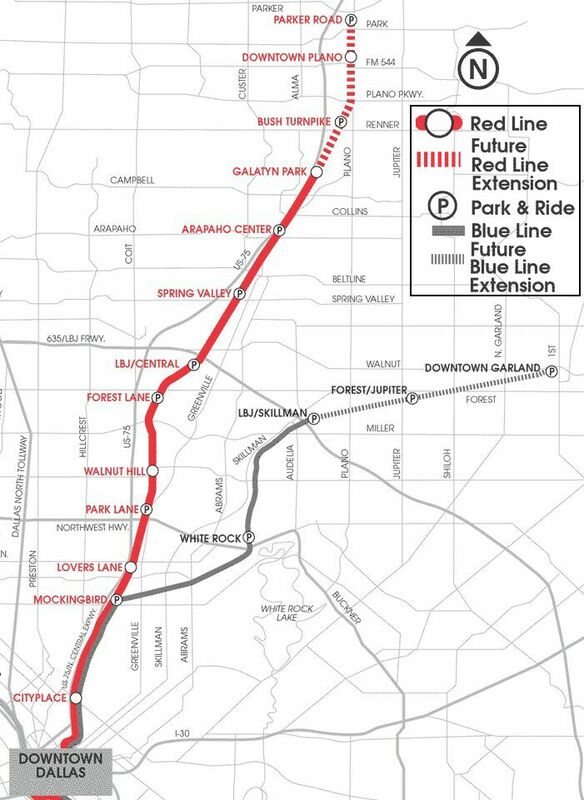 The new section of the system's Red Line extends from the existing Park Lane station to Galatyn Park in the northern suburbs (see map below). Writing in the Houston Chronicle, reporter Jim Henderson hailed the event: "Six years after the opening of an 11-mile starter line, the Dallas Area Rapid Transit Authority's light rail system has finally reached into the populous suburbs, stretching the infrastructure to 36 miles and boosting average weekday ridership to more than 40,000." Actually, Dallas's LRT ridership is now approaching the 50,000 per day mark. And that level of ridership -- on light rail alone -- is particularly impressive when you consider that it exceeds the total daily citywide ridership of the entire transit systems in such cities as Albuquerque, Akron, Charlotte, Oklahoma City, Omaha, Memphis, Little Rock, Jacksonville, indianapolis, and Ft. Worth. it's even more striking when contrasted with the dire official predictions of 30 years ago that "Texans won't get out of their cars to ride a train." A Public Transportation Development Manual, prepared in 1971 by Wilbur Smith & Associates for the Texas Mass Transportation Commission, declared that population density of at least 14,000 persons per square mile was necessary to support rail transit, and "No Texas city meets these criteria." Today, DART's metro-Dallas service area has a density of less than 3,000 per square mile – and ridership on both rail and bus services has been booming. In his Houston Chronicle report, Henderson underscored that the new service was a hit with Dallas-area travellers. "To riders such as Beckie Hoyt," he related, "the rail lines are a convenience that is long overdue." Henderson described how, waiting for her LRT train to pull out of Galatyn Station, Hoyt could see "the rush hour traffic, a sea of brake lights, inching along Central Expressway." "it's nice to not have to get into that" she told Henderson. In their own report on DART's Richardson LRT extension, Dallas Morning News reporters Tony Hartzel and Sara Post pointed out that "the 9.3-mile rail link also takes trains to the doorstep of Collin County, one of the nation's fastest-growing areas." Hartzel and Post also note that, according to the North Central Texas Council of Governments, Collin County's population has doubled since 1990 to almost 550,000 people. "That growth, which has occurred almost exclusively in the county's southern half, gives DART a pool of customers who can drive to several commuter-based stations, each with more than 1,000 parking spaces" they observe. But the rail system's most significant impact occurs in the areas which are directly served, says the Houston Chronicle's Henderson. Dallas is not yet on par with rail networks in New York or Chicago. It still is a predominantly park-and-ride service, but the July 1 opening of seven stations and 12 miles of track on the system's Red Line made it possible to navigate a large section of the Dallas metropolitan area -- from the massive VA Hospital south of town, to the zoo, to the downtown convention center, north to Richardson and west to DFW airport and on to Fort Worth -- without fighting traffic. Henderson also points out that "The Dallas rail line may offer a glimpse into the future for Houston, where work is 60 percent complete on a light rail line scheduled to open in January 2004." Extending the LRT system has proven even more affordable and cost-effective than installing the original system. DART officials expect the latest rail line extension, built in two segments in less than four years, to come in about 10% under its $205.5 million budget. And work on the further extension to Plano is already six months ahead of schedule. Besides the impact of the route extension itself, Henderson reports, "development near many of the 29 stations makes it possible not only to get to and from work but to shop, dine and enjoy nightlife along the way. A $2 pass is good for all trains and buses all day. Riders can exit and board as often as they like." One of the most notable development binges occurred at Mockingbird Station, less than four miles north of downtown. Linked to the DART station by a pedestrian bridge, the $105 million project includes 575,000 square feet of leasable space for loft apartments, restaurants, retailers and professional offices -- all just across Central Expressway from Southern Methodist University. The Gap, Urban Outfitters, Victoria's Secret, Virgin Megastore, Margarita Ranch, Cafe Express and Rockfish Seafood grill are a few of the tenants of what the developers call an "urban village." Suburban cities such as Richardson and Plano, which is set to receive rail service in December, didn't wait for the trains. "We had development in place in anticipation of DART arriving," said Richardson Mayor Gary Slagel. "We have been in this from the beginning, and we are very pleased." For now, the Red Line to his city, which roughly parallels the heavily traveled Central Expressway, terminates near the cluster of technology offices known as the Telecom Corridor. Also, it is walking distance from a new Renaissance Hotel, which was located there largely because of the DART station, Slagel said. Richardson also is planning a new $40 million performing arts center nearby. "It gives us a nice competitive advantage," he said. "It is good for the economy of the city." 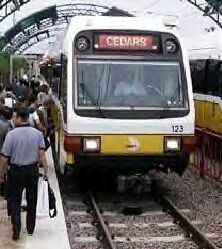 Later in 2002, DART's LRT system will extend into Collin County and the suburban city of Plano, which, Henderson notes, is "one of the fastest-growing areas in the country." Has he relates, "Plano city officials, too, are anticipating rail's arrival." in fact, as an indication of its enthusiasm for the coming LRT connection, Plano has placed a gas-powered replica of a San Francisco-style trolley car in service to link the LRT station to a bus transit center and major shopping areas. A few years back, Henderson notes, several Dallas suburbs voted not to participate in the regional Dallas metro-area system. But now, "having seen the development potential and public acceptance of rail transit," he recounts, "many have since petitioned for admittance to the club." At the time it was approved, Henderson points out, the DART transit dream seemed mighty risky – but that early risk has paid off. "Despite its shaky beginnings 20 years ago, DART has grown to a bus and rail system that carries more than 200,000 passengers a day over a 700-square-mile service area that includes Dallas and 12 suburban cities." "When light rail construction began in the 1990s," Henderson relates, "It was criticized for its cost, and the critics alleged that it would draw its ridership from bus riders, not motorists." However, while some bus riders have benefitted from the faster schedule speeds and more comfortable, reliable, and safe LRT transportation, quite a sizable proportion of the LRT riders have been attracted from Dallas's overcrowded freeways and arterials. 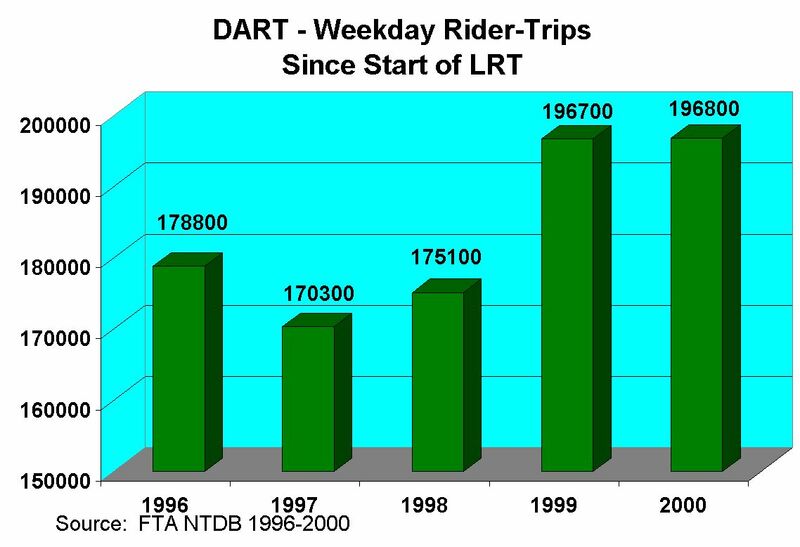 According to a 2000 study, some 41% of LRT riders had not been regular users of DART's transit services. "We have grown our ridership in all modes" noted DART spokesman Morgan Lyons. "Rail is up; buses are up; HOV [use of high-occupancy-vehicle lanes] is going up." 1990 and 2000 DART ridership increased by about 15.8 million annual trips. That roughly equates to about 53,000 daily new trips by transit – many of which no longer competing for road space with those of other Dallas-area motorists. That implies a net reduction in mobility congestion, thanks to light rail. As Henderson reports, "The growing popularity of DART has largely silenced its critics, and the agency is riding a wave of popularity and plaudits." He notes that in March 2002, D Magazine named DART Executive Director Gary Thomas "The Most Powerful Man in Dallas". Praises for the transit agency and its LRT system have continued to resound throughout the region. "The rail is going to open up a new set of experiences for people who live here and want to experience other things that are going on in the Dallas area", predicted Richardson Mayor Slagel. "The acceptance, I believe, will be very strong" he added. The new rail connection also gives Richardson residents a chance to expand their horizons and connect with Dallas's amenities, Mayor Slagel pointed out. According to the Dallas Morning News, Richardson and DART officials have met with major employers to explore the best ways for their employees and customers to avoid traffic and parking problems. "When you look at traveling on the freeways, you could have an incident that will delay you a half-hour" Walter Ragsdale, Richardson's director of transportation, told the Dallas Morning News. But, he says, LRT makes a big difference: "You can set your watch to these trains." Furthermore, Ragsdale pointed out, LRT opens up new mobility opportunities for Richardson residents. These were almost unthinkable with the previous single-mode alternative of driving, facing heavy traffic, road congestion, and parking hassles. "I think we have people in our community who haven't been to the Dallas Zoo in a long while, or ever" he noted, alluding to the fast, convenient LRT connection to the zoo that had just been added to his community. Making the new stations especially meaningful are the efforts to create a truly regional, interconnected transit system, observed Ray Noah, Richardson's DART board member since 1983. "Everyone is anxious to have their own trains" Noah pointed out. "Development of the southern sector train network has become extremely important to the success of the system. Now everyone is saying we've got to get people to the jobs." As Dallas News reporters Harzel and Post relate, "Along the line, business leaders and community officials believe the strip of land that holds the train tracks will offer a vital tool for economic development, employee recruitment and quality of life." They note that Presbyterian Hospital, adjacent to the new Walnut Hill Lane station, will now offer a new way for patients to reach the facility. The connection will also will allow hospital workers to avoid driving through the extremely busy Walnut Hill and Greenville Avenue interchange. "This is an opportunity for us to recruit employees from north and south of here" hospital president Mark Merrill told the News reporters. He noted that 70% of the hospital's employees live in North Dallas or Collin County areas. About 300 workers use DART, he said, a figure expected to double with trains now serving the area. Other major employers are also banking on benefits from the new LRT service. One example is Texas instruments (Ti), which has some 10,000 people working at several of its campuses in North Dallas. Rail stations and new shuttlebus connections at Forest Lane and LBJ/Central will serve those employees well, Steve Moore, director of real estate for the high-tech company, told the Dallas News. The company recently surveyed its employees and found 59% reporting they would ride the rail line one to four times a month. Fourteen percent said they'd ride it daily, Moore related. "it's a virtual parking garage for us" he said, when interviewed at the LBJ/Central station, where pictures are displayed of TI legend Jack Kilby, inventor of the integrated circuit, and Julia and John Floyd, pioneer settlers in what is now an urban center adjacent to the Dallas High Five interchange. Elsewhere along the line, "plans are shaping up on the ground or on the drawing board" report Hartzel and Post. For example, 12 acres of land currently empty next to Richardson's Galatyn Park station could eventually sprout multi-story office towers mixed with apartments, according to Don Dillard, vice president of Galatyn Park Corporation. A further mile north, the future train station at the President George Bush Turnpike and available land inspires Dillard to imagine "another Galleria with a train running through it." Expansion of DART's LRT system is definitely on a fast track. July's seven openings mark the largest number of stations to open in one day since DART's starter system debuted on 14 June 1996, report Hartzel and Post. in November 2002, the agency will open two stations in Garland, and, in December, three more stations in Richardson and Plano. "Only six years ago, we opened our first 20 miles. This year, we're more than doubling the system" noted Doug Allen, DART's executive vice president for programming. "That pace of expansion is really unheard of" he added. And with voter approval in 2000 of an ambitious bond package, say the Dallas Morning News reporters, trains will reach many more destinations in the next decade. DART should again double its system to more than 90 miles by 2013, with new lines spreading out to irving, Farmers Branch, Carrollton, Fair Park, and Pleasant Grove starting in 2007. Other extensions to Rowlett and interstate 20 in southern Dallas are expected to be completed by 2013. US Senator Kay Bailey Hutchison, described by Dallas Morning News reporters Hartzel and Post as "a strong advocate for public transportation who helped DART secure federal funding", attended the opening-day festivities kicking off the inauguration of the seven new LRT stations. She predicted the expansion will help reduce the number of cars on the roads and curb pollution throughout the region. "Any metropolitan area in the United States of America that says to me, 'We think we can do rail' ... I say, 'Go see DART,' " Sen. Hutchison emphasized. "Ours is the absolute best new system in America." And, according to Hartzel and Post, the new extension is getting rave reviews from those who count the most – passengers. The reporters highlight the example of Richardson resident Lois Ferrara, noting that when she was growing up in Washington, DC, the capital's Metro transit system was "part of her lifestyle." Ferrara told the News reporters she's been waiting 20 years to see a similar mass transit system in the Dallas area. "I'm looking forward to riding on it frequently" Ferrara enthused. "I don't think people realize just how much it will change their lives. They don't realize how riding DART will become second nature."